I went to an event a few days ago with Dave Orchard (who is our VP of Engineering) and I thought I’d tell you about it, since it had to do with our industry (social gaming) and how businesses can use social games to improve their bottom line. The event was organized by the League of Kickass Business People, a group that is made up of Canadian entrepreneurs, digital media and marketing people. (An inspired bunch, most of the people in the organization like to stay ahead of the curve and on-trend when it comes to the tech world.) I was excited to represent Ayogo at my first gaming-exclusive industry event and I was pleasantly surprised by the turn out. 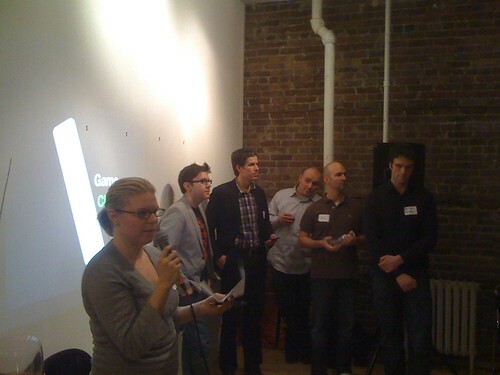 The room was packed with influencers from the biggest gaming companies down to the smaller startups. It was also really nice to see a lot of women exes., mostly from the League and also from Women in Games Vancouver. The panel of speakers included Steve Bocska, President of Pug Pharm Productions, Mac Flavelle from Compass Engine, Mark Magnusson of Magnus Media, Ian Clark with RealSpace and Victor Lucas, the EP and co-host of The Electric Playground. …and in today’s business environment, measurable results are the currency that matters. Play can be pretty serious business.